While slightly fewer work zone crashes were recorded in 2018, the numbers remain high. Last year, 2,523 work zone crashes resulting in 1,256 injuries and nine fatalities were reported. This was a 5.4% decrease in crashes, a 5.35% decrease in injuries and an 18% decrease in fatalities from 2017. 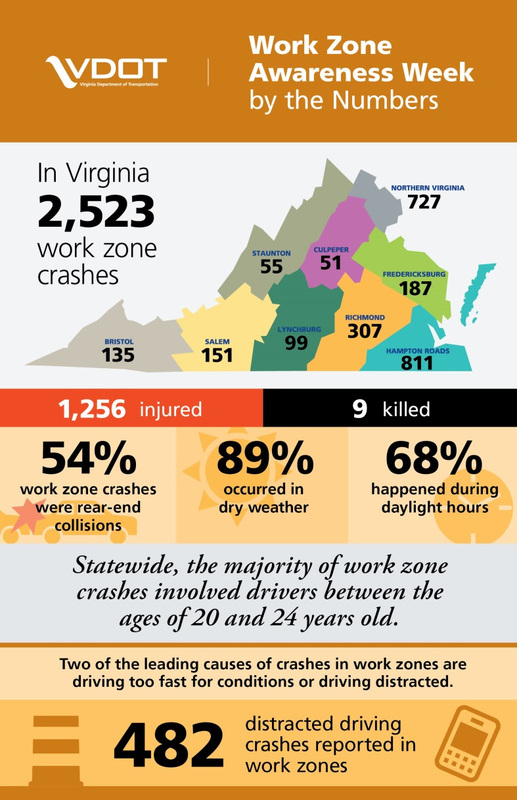 In a constant effort to reduce work zone crashes, VDOT continues to focus on best safety practices and encourage safe travel in work zones for National Work Zone Awareness Week (NWZAW). 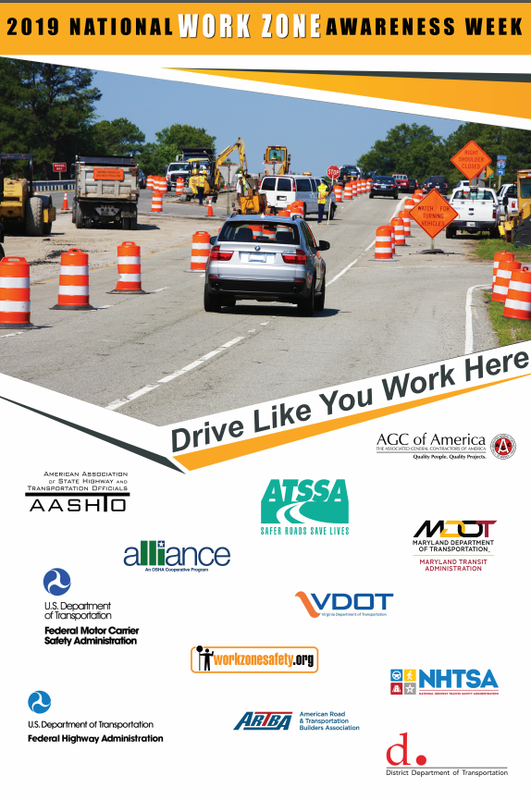 The nationwide theme, “Drive Like You Work Here” is part of the campaign observed this year from April 8-12, reminding drivers that work zones are where thousands of road crews spend much of their time at work. Monday, April 8: The public is invited to a 6:30 p.m. vigil honoring employees who lost their lives on the job. Note: Due to forecasted inclement weather, the event has been moved indoors at the Virginia Transportation Research Council, 530 Edgemont Road, Charlottesville, VA 22903. Wednesday, April 10: Go Orange Day. Wear orange to help start a conversation about work zone safety and share your support by posting pictures on your social media accounts with #GoOrangeDayVA. Follow VDOT on Facebook, Instagram and Twitter. Show us your support by liking, sharing and posting with the hashtag #NWZAW. Focus and minimize distractions. Focus your full attention on the road and those traveling around you. Avoid using phones, changing radio stations or eating. Expect the unexpected. Keep an eye out for workers and slow-moving equipment. Follow the signs. Signs and flaggers will direct you through work zones. Expect changes in traffic patterns as a project progresses. Don’t tailgate. Unexpected stops frequently occur in work zones. Don’t speed. Enhanced fines of up to $500 may be levied for speeding in a work zone. Be patient. Crews are working to improve the safety and comfort of your travels. Never change lanes in a work zone. Know before you go. Call 511 for up-to-the-minute traffic and weather information from any phone in Virginia. Before you travel, log on to 511Virginia or check the 511 Virginia mobile app for road and traffic conditions, weather forecasts and live traffic cameras on many major highways.